Fredrick Freer original etching "The Token"
Medium: original etching. 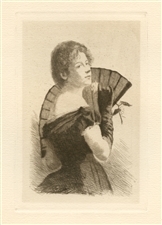 This impression was printed on laid paper and published in 1887 by the New York Etching Club. Plate size: 6 x 4 inches. Not signed.